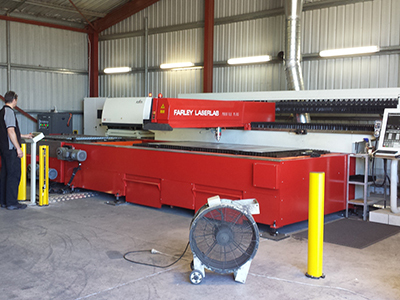 Farley's Magician WaterJet Machine has been engineered to give you all the best quality Hypertherm Components to combine to give you the most affordable High Quality WaterJet Cutting Machine on the Australian Market Today. Meaning you get the best quality Hypertherm Cut including all at the best prices. So now for under $230,000 + GST you will be able to achieve the best quality, consistent and easy to use low maintenance WaterJet cutting on the market to be compete against others who have spent $300,000 +. Hypertherm HyPrecision waterjets were engineered using Advanced Intensifier Technology (AIT). By rethinking the way the intensifier pump works, we were able to make it work harder, last longer and require less service time. AIT, it’s what makes Hypertherm HyPrecision waterjets more cost effective than any other waterjet in the world. Hydraulic rod seals and plunger bearings are readily accessed from the outside of the hydraulic end cap. Hydraulic center section features an advanced piston design, which minimizes seal wear and improves component life. Check valve utilizes a screwless, low-pressure poppet design that enables quick evaluation of key contact surfaces. This feature also allows for noticeably faster component replacement. Advanced electronics provide smooth, reliable shifting for optimum cut quality. Shift times are even monitored to ensure optimal pump performance. Durable threaded-rod design simplifies high-pressure end removal for quick seal maintenance. Meanwhile, the nonthreaded cylinder design increases reliability. Large diameter ceramic plunger produces more water per stroke with reduced friction, yielding maximum seal life.